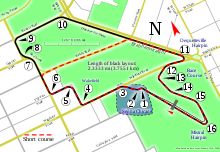 The 1992 Australian Grand Prix was a Formula One motor race held at Adelaide on 8 November 1992. It was the sixteenth and final round of the 1992 FIA Formula One World Championship. The most significant moment was a collision between Ayrton Senna and Nigel Mansell as the Brazilian attempted to overtake the Englishman, eliminating both drivers. This was intended to be Mansell's final Formula One race before moving to IndyCars, although he returned briefly in 1994 and 1995. Martin Brundle (who spent 1993 with Ligier), race winner Gerhard Berger (who returned to Ferrari for 1993) and Riccardo Patrese (who joined Benetton for 1993) are among the many drivers for whom this was the final race with their current teams, while for Jan Lammers, Stefano Modena, Maurício Gugelmin, Olivier Grouillard it was the last race of their career. It was also rumored that it would be the last race for Ayrton Senna at McLaren, however this would ultimately prove false as the Brazilian would remain with the Woking based team for 1993. Nicola Larini started this race from the back of the grid. Jordan scored their only point of the season with Stefano Modena, while Thierry Boutsen (who won here in 1989) scored his only 1992 season points, and indeed the last points of his career. Benetton's double podium finish ensured that they scored points in every round, as Benetton were the first team to score points in every round of a season since Lotus in 1963. This was McLaren's final race using a Honda engine until 2015. The company ceased their full factory involvement in the sport following this race, although the Mugen arm of the company continued. They returned in 2000 as engine supplier to BAR. For both the Dallara and March teams, this was their last appearance in the sport. ^ "Foster's Australian Grand Prix - QUALIFYING 1". formula1.com. Retrieved 15 September 2017. ^ "Foster's Australian Grand Prix - QUALIFYING 2". formula1.com. Retrieved 15 September 2017. ^ "Foster's Australian Grand Prix - OVERALL QUALIFYING". formula1.com. Retrieved 15 September 2017. ^ "1992 Australian Grand Prix". formula1.com. Archived from the original on 2 November 2014. Retrieved 23 December 2015. ^ a b "Australia 1992 - Championship • STATS F1". www.statsf1.com. Retrieved 6 March 2019.